A new day and a new upgrade to the SBT. 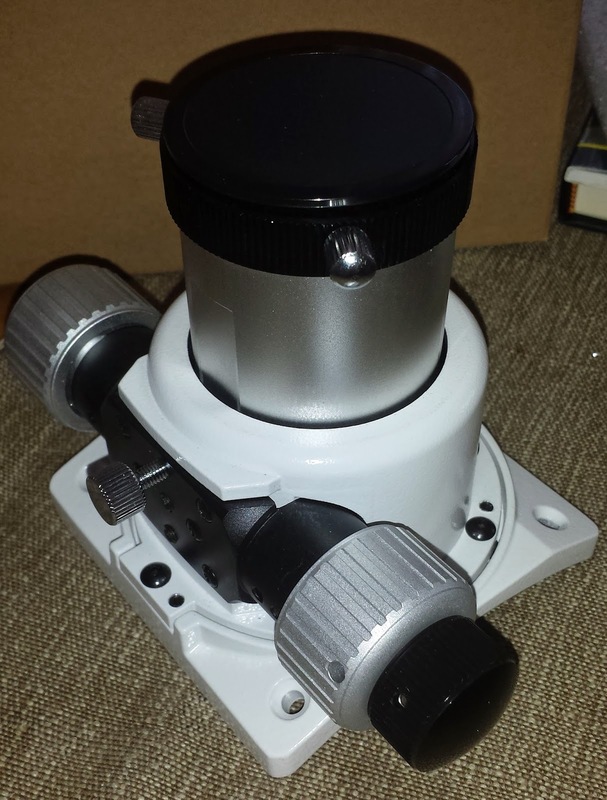 Back when I ordered the SBT originally, I also included a SkyWatcher Dual Speed focuser for it too. At that point in time, I was advised of a lead time before it would be available, which I was happy to accept. Fast forward several weeks, and this week I have taken delivery of the focuser. 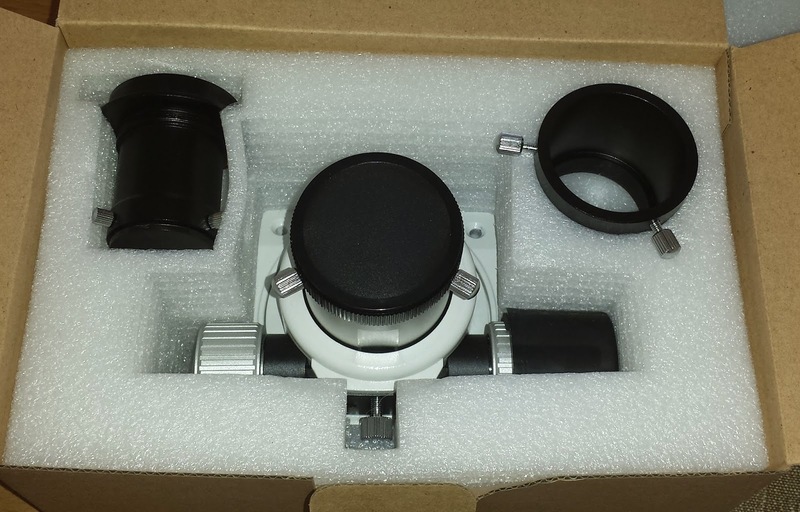 It’s arrived well packaged in foam and comes with the 2 inch and 1.25 inch eyepiece adapters that all SkyWatcher focusers seem to require to accept an eyepiece. My first impressions were that it was a solidly built component, although the plastic focuser knobs each side of the unit doesn’t scream absolute quality. But, at the end of the day, it was cheaper than other dual speed focusers out there and so, long as it performs well and doesn’t break easily, I’m happy. The action of the focus wheel seems very smooth, if a little bit stiff to start off with. 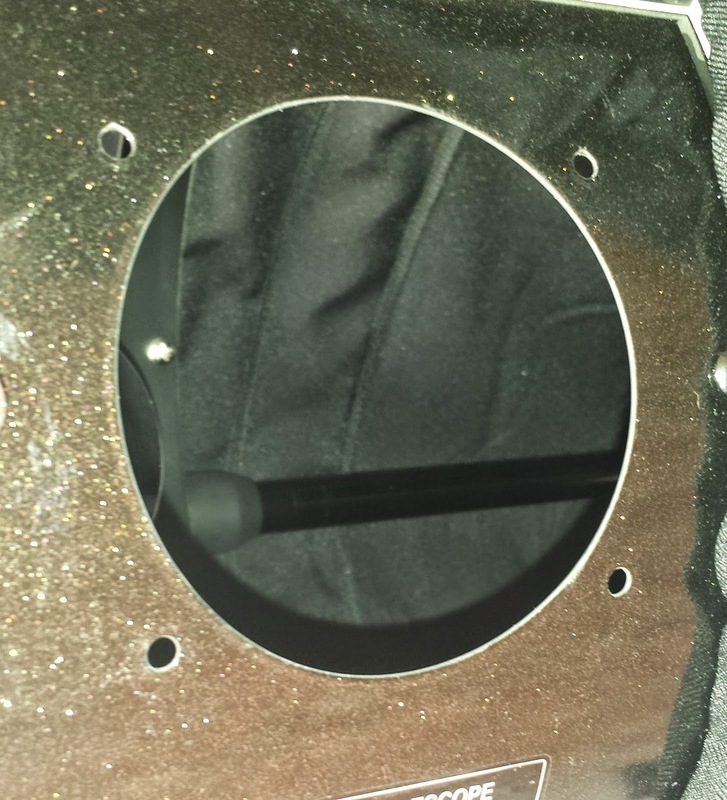 However, the micros focuser knob positioned on the right side of the unit is much easier and very smooth. So far so good. 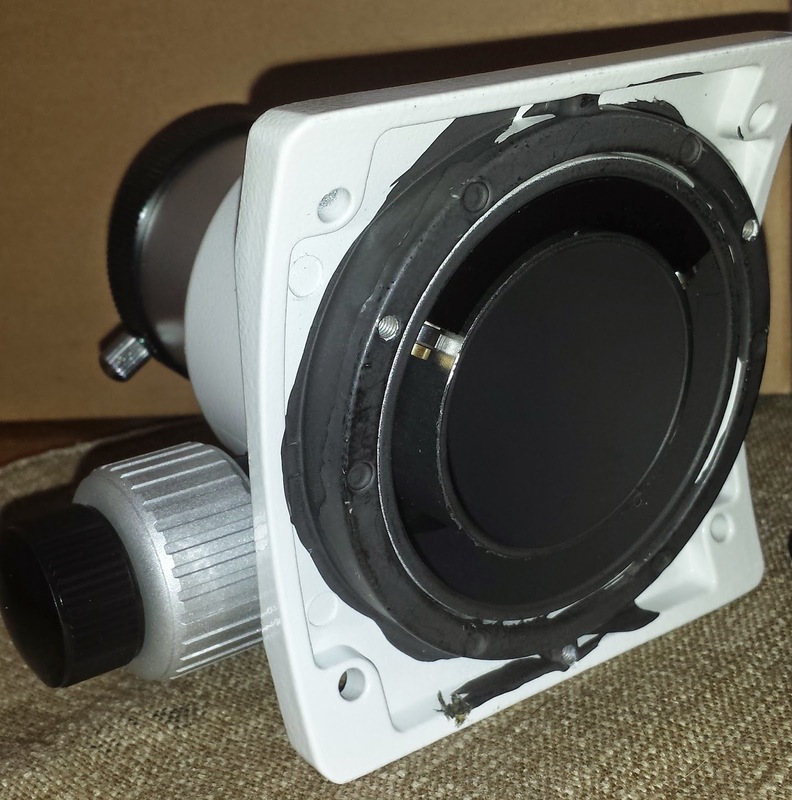 This is the focuser that the SBT has come with. Itself perfectly adequate for the job. It’s almost identical to the one on the 150p as well, so is ideal for the job it does. 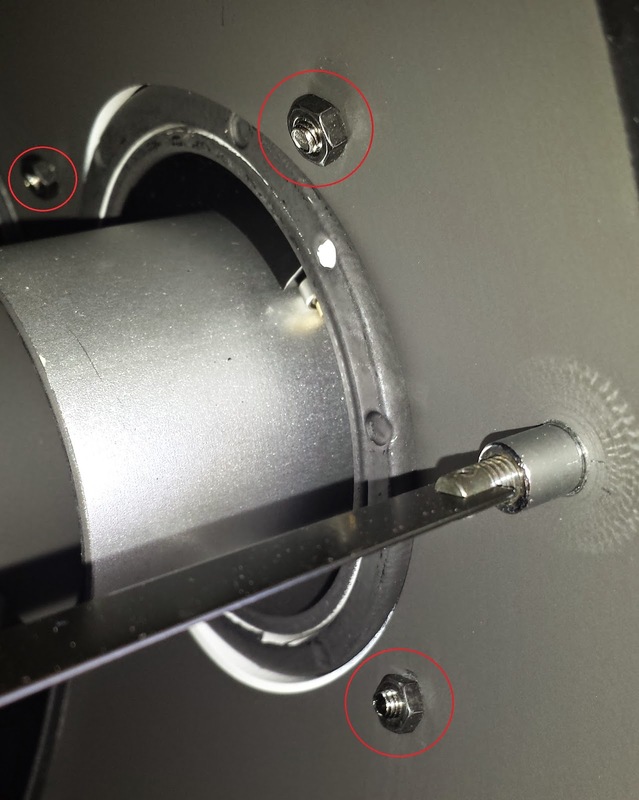 The focuser is held into place on the side of the secondary section of the OTA by 4 bolts with small nuts on the inside of the tube. To get to them, I extended the OTA of the scope to its full length and then brought the scope down to near horizontal. 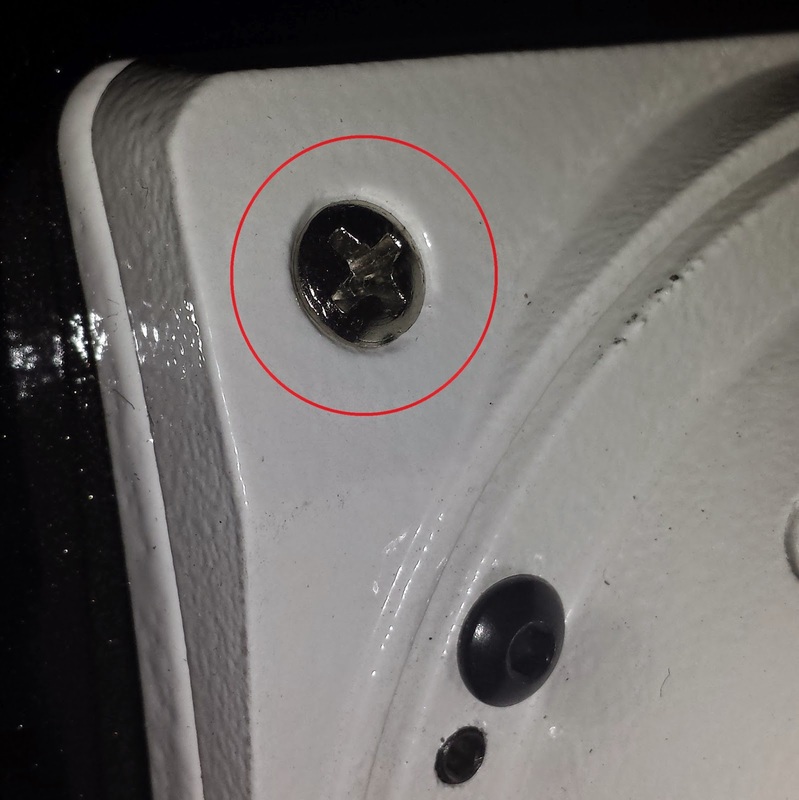 This meant that when I started removing the short bolts, if I were to drop something, then nothing of importance was in danger of being hit by falling parts. When I removed the original focuser, I realised that there was a second part to the original focuser, made of plastic. 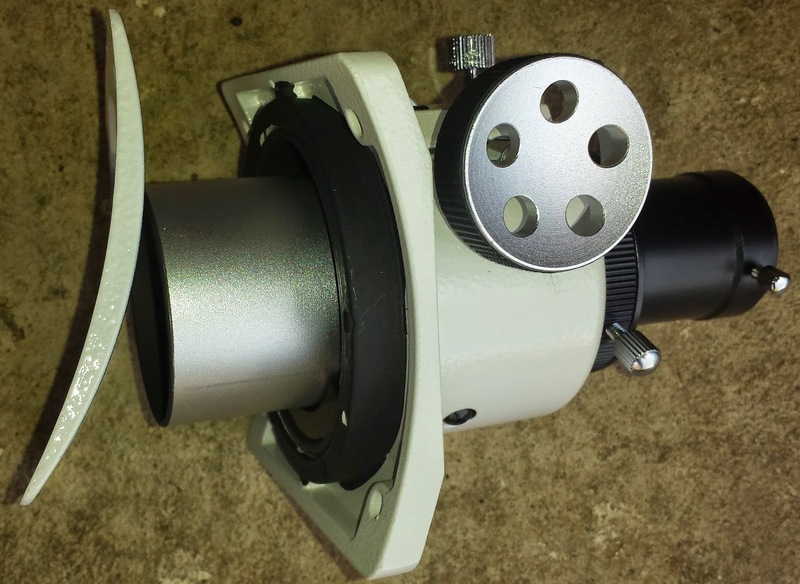 Its purpose looks to be an adapter to allow the convex curvature of the tube to marry up with the concave curvature of the focuser base. This part needs to be retained and used with the new focuser. It fits next to the focuser base and as is shown in the following picture. Once the 4 nuts and bolts are removed, I was left with the predrilled focuser hole in the side of the tube, and the 4 predrilled bolt holes. Then, it’s just a question of putting the new focuser in place, complete with the plastic adapter plate, onto the side of the OTA. The original 4 nuts and bolts were used to attached the new focuser into place. This is quite an easy upgrade to make to the scope. It’s just a straight forward swap out. 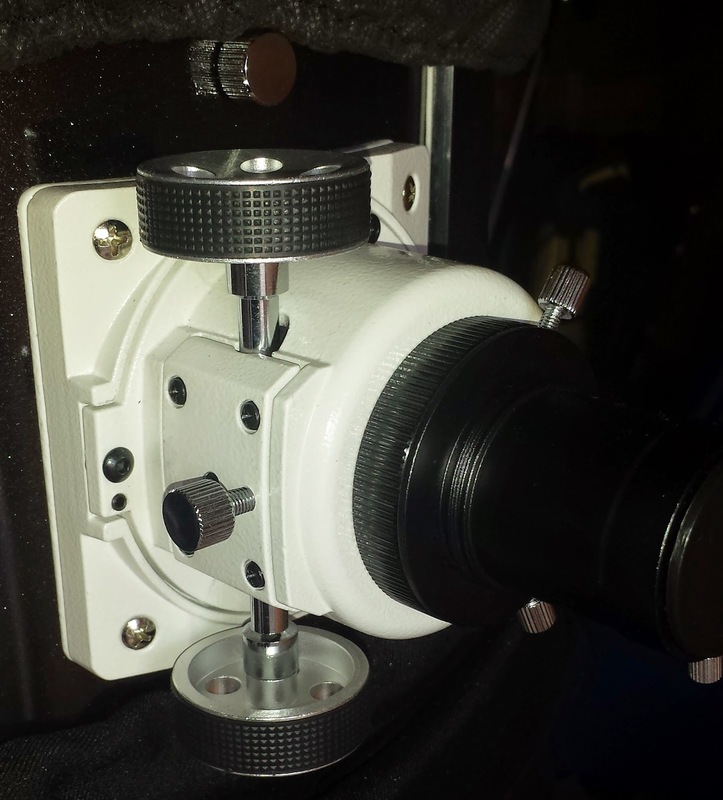 I’m not sure how focusers by different manufacturers will fit, or if they need additional holes to be drilled to accommodate a different size base plate. Now all I need to do is get out for first light with it! Prep for Astrocamp is underway! It's been a busy week or so since my last session, and at the moment, it's quite tricky to determine where the next one is going to come from. But, that doesn't stop me preparing for the next one. I've had a look at the records of my sessions for the last couple of years and done a bit of research into what is visible from the UK in the night sky during April/May. There sure is masses to go after. Indeed a whole universe awaits! With an eye on Astrocamp during the second weekend of May, I have decided to compile a target list for the weekend. Ultimately, the great British weather is going to have the last say, but should there be opportunity of observing, it will be nice to have something to go with. All these targets are ones that I have not had the chance to observe as yet, and will be all new for me. They cover a variety of object types from clusters to nebula to galaxies. I suppose the important thing is though. not to get too obsessed with the list. I dare say during the weekend, many familiar targets will be visited too. So, without further delay, here's my list. Let me know what you think! Comments on my blog are always welcome, but are moderated before publishing. Feedback is also welcome. And also, please subscribe to the blog at the bottom of the page to receive each blog post via email. Observing Report - The SBT shows off it's capabilities. I start off by planning a bit of trial for this update. For a while, I've been trying to think of a way to allow people to see something resembling the views I have through the eyepiece. We have all seen the images produced by the Hubble space telescope, and by amateurs who dedicate their time and savings into very expensive equipment to bring awesome views. In reality though, these images are nothing like what we see through the eyepiece. So, how do I try to convey what I see, without exaggeration. I have seen many excellent sketches that people have made of their observations. These sketches have given the best representation that I have so far come across. One problem though, I'm not really blessed with artistic talents. So, I have decided to turn to that well known amateur astronomy tool, Stellarium. Stellarium has a feature called 'Ocular View' that you can set the parameters of your scope and eyepieces in, allowing the program to give you a representative field of view. I have decided to use this feature to give an idea of how big these features are through the scope, although what I can't always replicate is their brightness. So, the report. The weather has been settled for the last 5 days or so, with pleasant Spring sunshine on most days. The ongoing battle of lighter evenings, resulting in later nights conflicting with 6 am wake up calls for dog walks mean that at the moment, opportunities for observing have to be carefully selected. The day and night of 18th April had an excellent forecast. Barely a cloud crossed the sky all day, but the breeze was very evident. I set up the SBT out the back garden just after the sun set. The astronomy forecast was looking good with wind slightly decreasing through the night. Whereas the wind can prove to be a nuisance with seeing conditions sometimes, it does keep the dew away from the optics and Telrad. First task when I went outside was to line up the Telrad which I did on Jupiter. However, I noticed some very strange 'smearing' in the bright image. A collimation check with the laser collimater showed that the secondary was way out of line. 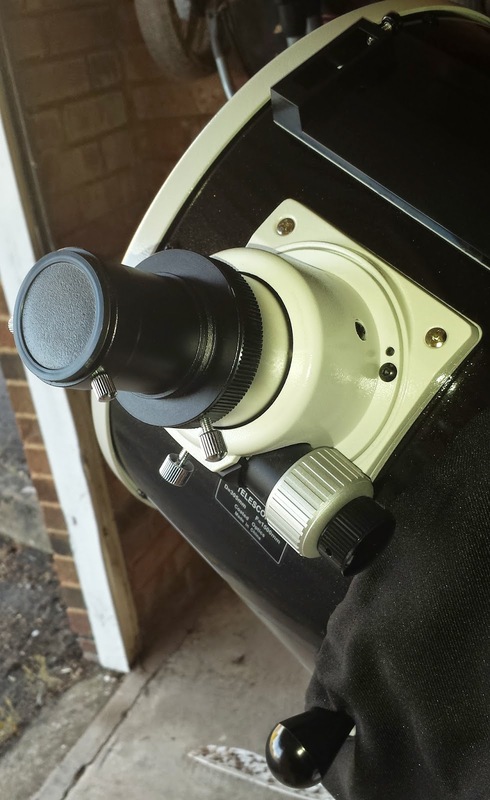 Thankfully, one of the original upgrades I did on the scope was to fit thumbscrews to the secondary to make collimation much easier. Less than 2 minutes later, I was all aligned, up and running and ready for a great nights observing. 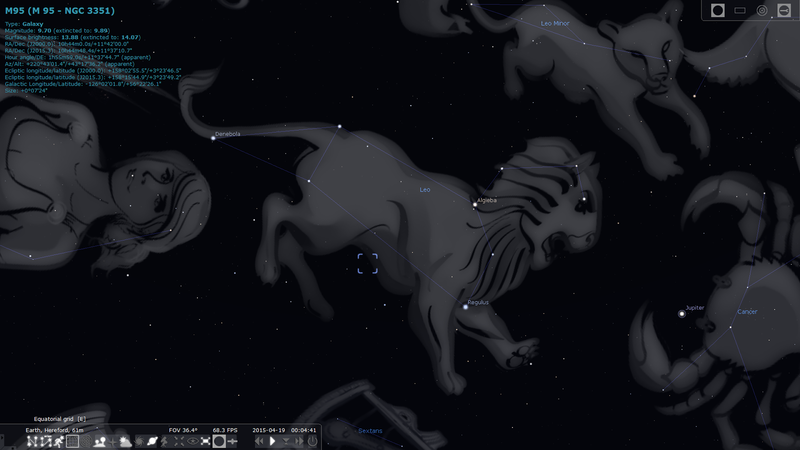 The constellation of Leo had already risen high enough in the sky for me to see it in its entirety. Leo is awash with plenty of targets for a 12 inch dobsonian scope. The constellation can be seen below, complete with Stellarium artwork to help bring out the shape of the constellation. There are two well known collections of galaxy target to look at in Leo. Both of them can be found across the belly and hind of the lion. 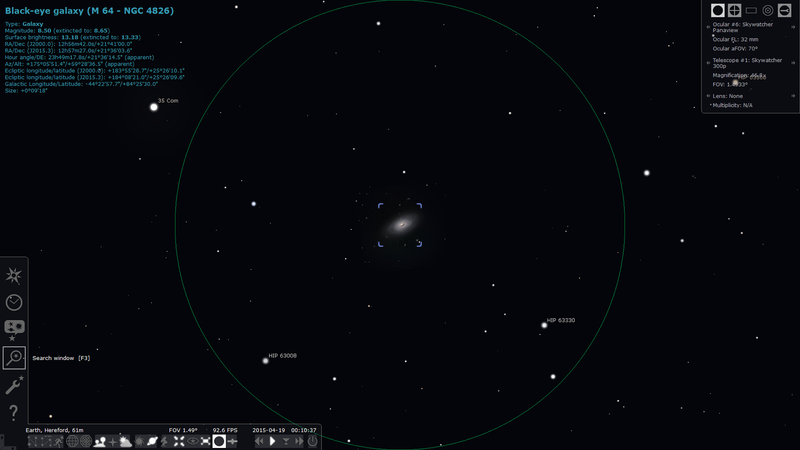 My first objects to look at were the Leo Triplet of M65, M66 and NGC 3628. 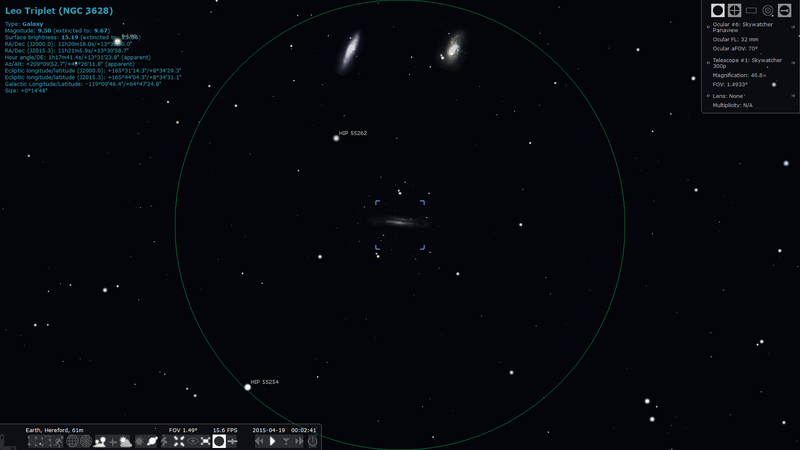 Using Stellariums ocular view feature, I can show how the triplet is set out in the eyepiece. The galaxies appeared much dimmer through the eyepiece of the telescope, but the moonless night and very good seeing conditions meant that they were easily picked out again the darker background of the night sly. The Leo triplet were one of the first collections of galaxies I looked at through the SBT, and at over magnitude 9 shows what the SBT is capable of. It gives an excellent benchmark. The other well know collection of targets in Leo that were next on my list were part of the Leo group of galaxies, M95, M96, M105 and NGC 3384. These are two spiral galaxies and two elliptical galaxies. The 4 targets were a little too big to fit in a single field of view using the 32mm Panaview eyepiece. I made a brief sketch in my notebook which showed M95 as I looked at the collection was just above and left of the field of view as I looked through the eyepiece. At first, I didn't really know for sure what target was what, especially taking into account the strange things two mirrors and a bunch of lenses in the eyepiece does by flipping the image back and forth. 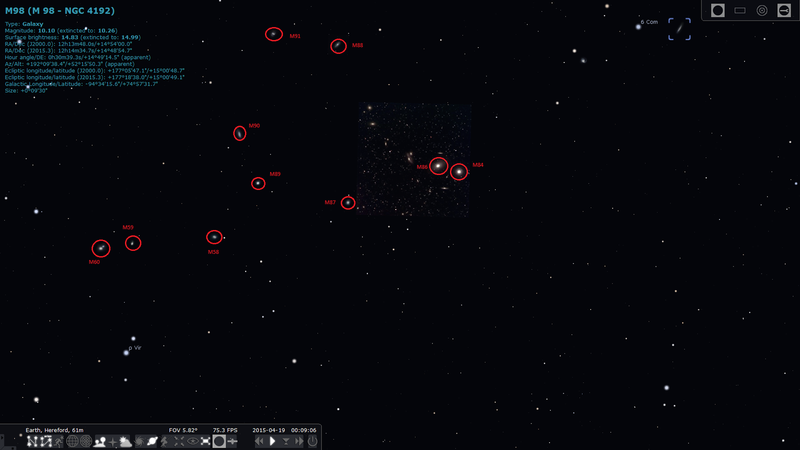 However, from the sketch in the notebook, and using Stellarium, I was able to confirm the targets after the session. "Feint but with defined almost perfect round core in center". In the view above, the spiral galaxy is very bright. In reality, it was much dimmer in the eyepiece, but the core was easily picked out against the smudge of the rest of the structure. "Slightly dimmer than M100. Appears smaller too. Possibly see structure @25 mm but hard to say for sure." For this target, I changed the to the 25 mm BST eyepiece. I expected to lose some of the brightness of the structure, but I couldn't really detect any loss in quality of the image. It is a target that I would like to return to in the future and spend more time observing at different magnifications. Now, onto the highlight of the observing night for me. My notebook gives a little description of what it was like. But, there was so much more going on in the eyepiece. I had switched back to the 2 inch Panaview eyepiece ready to start observing around Virgo. "Virgo - wow! Counted 9 other galaxies + possibly more! Just amazing. Problem with big dob here - too much to see." The three constellations of Leo, Virgo and Coma Berenices hide vast riches of galaxies and other targets. A positive treasure trove of targets for galaxy hunters with big light bucket gathering dobsonians. So, here's the list of targets I think I observed. It's very hard to be absolutely sure at my skill level, without the help of computer or Go To abilities to positively confirm the targets, but I've done the best I can..
M88, M86, M84, M87, M89, M90, M59, M58, M60 and M91. They can be seen scattered around the image below, each circled in red and labelled. This is certainly an area of the sky that I will be revisiting at the earliest opportunity. Also, hopefully, skies will be clear at astrocamp and I shall spend a good chunk of time observing around these constellations from there too. It really is tricky to convey how crammed this area of the sky is with targets, many of which are observable using the SBT, but a majority of which are beyond the ability of even the SBT I think. Leaving that plethora of targets, I decided to try to hone in on single targets again. 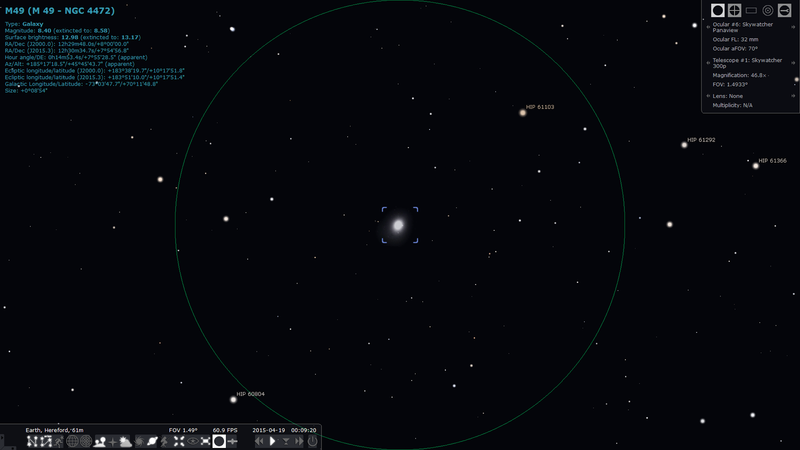 So, I started to track down M49, another elliptical galaxy in Virgo. "To cap off an awesome part of the session! Very nice elliptical galaxy. 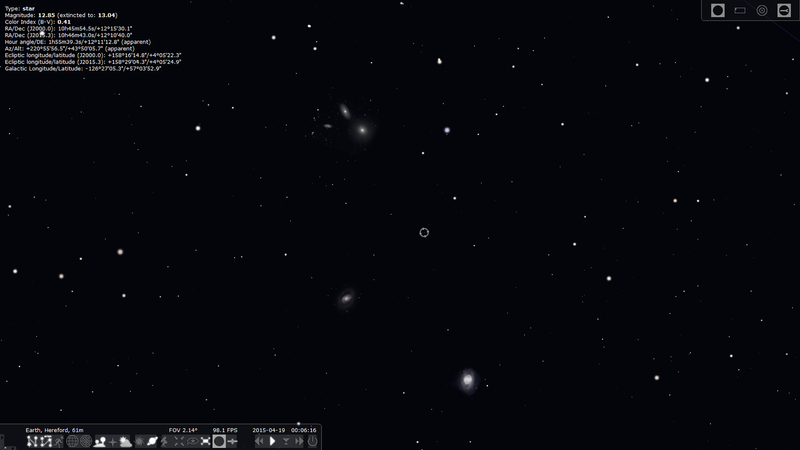 Slightly brighter than the others in the Virgo cluster than I have seen tonight." Though in the same constellation as the others, as you can see in the ocular view above, the galaxy is a little more detached from many of the other targets. Nevertheless, it's still about 56 million light years away. One of the features to keep an eye out for this month is the path of Jupiter passing close by to my next target, M44, or, The Beehive Cluster. It is a target I have visited through the scope many times before, mostly with the SBT's little brother, the 150p. It is a vast open cluster with very bright stars. Conditions were very good, dark and clear, enough so that I could just make out the cluster naked eye. It was sure to be an awesome site through the 2 inch EP and the SBT. "M44 - Beehive Cluster. First time @32mm. V-bright and rich cluster. Poss naked eye tonight..."
The ocular view below is quite realistic in this case. The brightness is quite well adjusted within the computer program. Leaving M44 behind, I tracked down another cluster. This time the globular cluster of M53. It's much more condensed that M44, but is still very bright and pretty. I decided to stay with the 32 mm EP, but I think with the 18 mm BST I should be able to resolve many more individual stars next time I come across the target. The cold was starting to penetrate through the layers. I had dressed more for a summers evening observing session than a spring session. The night time temperatures reminded me that we have barely said goodbye to winter. I was having such a good session that I didn't want to stop, but I was starting to get a bit cold. It's not often I get the chance to have a fully free session with no considerations for the next day. A couple more targets to finish off and that would be me done for the night. M65 is known as The Black Eye galaxy and take it's name from a very distinctive small black area of dust and gas close to the brighter core of the spiral galaxy. This is sometimes said to be visible in smaller amateur scopes. I'd like to think that I could make out the black eye, but with my own tired eyes, it was hard to confirm. It's a cracking little target though! The final target of the session proved to be a bit of mystery until this morning. Whilst having a final 'look and nudge' with the SBT in Coma Berenices. I came across a very thin and really pretty target. It was surely another elliptical galaxy, but I didn't know what one. That area of the sky only has limited stars of naked eye visibility, so I struggled with the Telrad to identify what it was I had seen. It was all the more tricky when I take into consideration how many potential observable targets there are in that section of the sky. I ended up resorting to drawing what I saw in the field of view on the eyepiece. I was using the 2 inch panaview 32 mm, so I decided to draw around the eyepiece cap which then give me the template to draw in what I was seeing. I estimated the target to be above magnitude 9 which i was able to do by comparing what I been looking at throughout the session. I sketched in the main target and relative size. Next, I added the stars that I was able to pick out with ease and put them in their relative positions. I hoped that this would be enough for me to use Stellarium and its ocular feature to pick out the features I had recorded in the sketch. 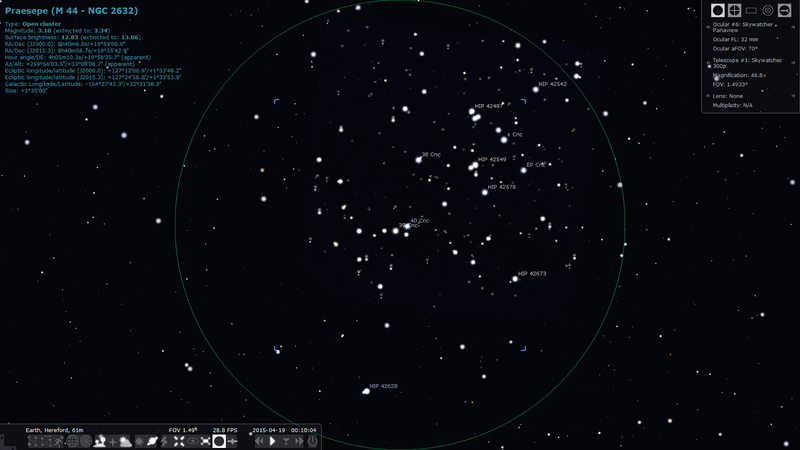 This morning, I fired up Stellarium and started to browse around the constellation of Coma Berenices. I new that it was reasonably significant due to its magnitude and size, so it ought to be listed and perhaps photographed too. After a while, I found what I was looking for, but as it turned out, there is no picture in my version of Stellarium of the target. What I had stumbled across is designated NGC 4565 and C38 - The Needle Galaxy. It's a sideways on spiral galaxy which appears very long and thin. A bit more time looking for images on line confirmed what I had sketched whilst at the EP. With fingers beginning to go numb, and the task of having to transport the SBT back out to the garage, it was time to close the session. It's been the best session for quite a while. For once, free time, weather and opportunity have all come together in my favour. A marathon of a session deserves a marathon write up. I hope that the pictures taken from Stellarium have given people at least a small understanding of what it can be like to view through the eyepiece. Excitement mounts as I get lost in Virgo. Good day to you the reader! This is a bit of a catch-up post. It's been a manic last week so, even though the observing weather has been pretty good, work commitments have kept me away from the SBT during the working week. However, I did manage to get out for a quick session on the evening of Monday 6th. The session wasn't planned as such, so I had no specific targets in mind, but I did want to see C/2014 Q2 Comet Lovejoy whilst still observable in our night sky. With the change to British Summer Time, the wait for true darkness is prolonged until late into the evening now. With that in mind, I decided to start off looking at one of the brighter objects in the current skies, Jupiter. I pushed the scope around and got the huge planet in the field of view. At first, the view I got was quite familiar. The focuser on the SBT is a little stiffer than on the 150p, but I brought the image into a good image using the 15mm BST EP. The seeing conditions were pretty good as I thought, so I decided to see how I got on with the 8mm BST. I swapped it out and turned the focus wheel. The image that was brought to me was as crisp and clean as I had ever seen Jupiter in. It was cracking. I spent a few seconds just admiring the view I was getting, when I noticed a distinctive mark on one of the equatorial belts. I started to look a bit harder and the seeing conditions seemed to improve a step further. Then it dawned on me, What I was looking at was the famous Great Red Spot on Jupiter. This was the first time I had eve seen in. Incredibly satisfying and pleasing. I decided to try the 5mm BST EP, and though I could still make out the feature, the 8mm give me the better, crisper, cleaner view. The sky still wasn't completely dark, but I didn't have time to wait another hour or so for it to come, so I pressed on. 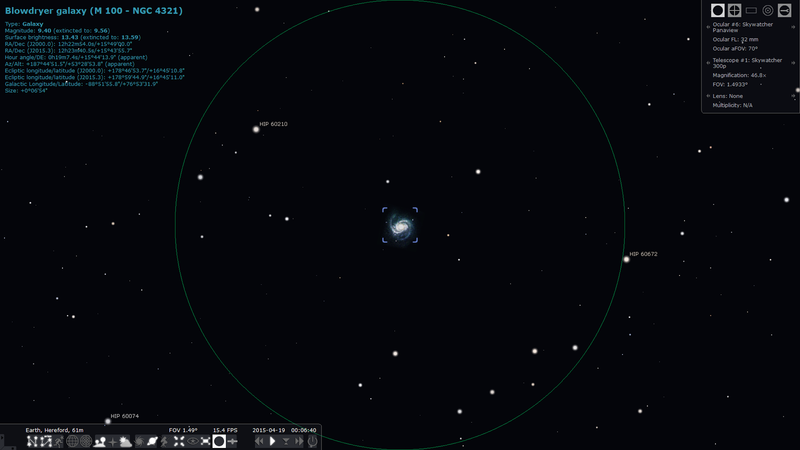 I looked up on Stellarium where C/2014 Q2 Comet Lovejoy. It was just next to the main constellation of Cassiopeia according to the app, to a brought the scope around, engaged the Telrad and started the search. I was only using Stellarium on my smart phone, so it was tricky to get an exact fix on it. I spent about 5 or 10 minutes searching and then came across the faint smudge of the fading comet. It was pleasing to see it, in so much that I can log it as observed. However, I couldn't make out much detail in it at all. Unfortunately, I think I have left it a little too long before making a true concerted effort into finding. During the session, the sky was also graced by a passing of the ISS. Particularly bright as it passed above the rooftops. Leo is now in prime position for observing from the back yard, so I decided to pop in the 2" EP and take a look for M95 and M96. I found them both with relative ease, although because the conditions, they didn't appear quite as clearly as the did when I had first light with the SBT. Not too discouraged, I decided to take a first glance at Virgo. The constellation of Virgo is widely regarding as an incredibly 'galaxy rich' constellation, with many of them around the observable magnitude 10 to 11 range. Indeed, it is home to the 'Realm of the Galaxies'. Still with the 2" 32mm EP I started looking through the telrad to get the scope lined up. My first look through the EP didn't initially show much, I wasn't looking for one particular target in Virgo. But, with a gentle nudge, I started to come across multiple very faint smudges of grey wispy features. I was finding it very hard to pick out some of the stars in the constellation to star hop to specific features, and therefor confirm what I was looking at. Nevertheless. I am pleased with my first foray into looking at Virgo with the SBT. In approximately one months time, I shall attending Astro Camp in Cwmdu near Brecon, South Wales. I've got a small pitch, 5m x 5m so need to be careful as to what to take. I have taken delivery of a small 2m by 1,5m utility tent in which I can keep the SBT and hopefully, it's younger brother, the 150p. So, the list is starting to be compiled of what I need to pack to take with me.